For those who desire a change in their appearance, shaving long hair is likely the most dramatic change to make. Most men consider shaving their heads at least once in their lifetime since the style has become quite popular. A few daring women are taking the plunge into baldness. Whatever your motive, here are a few things to consider as you shave your long hair. Cut off extremely long hair using scissors first. If you hair is longer than shoulder length, gather it into a ponytail at the nape of your neck and chop it off. Trim remaining hair down to a short stubble. Try to get it as short as possible using a set of hair trimmers--you can do it yourself or have a friend help you. The haircut doesn't need to be perfectly even, just shorter than a quarter of an inch. Wet your head as much as possible. Taking a warm shower is a great idea right before you shave your head. You can also wrap a warm, damp towel around your head for a few minutes to soften the scalp and hair to make it easier and more comfortable to shave. Apply a shaving lubricant such as an oil, gel, or foam. Work it into the scalp as much as possible for a clean, close shave. Most experienced head shavers recommend using a good shaving oil. 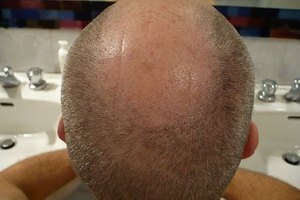 Shave your head using slow, long even strokes with light pressure. Start with sections of hair that tend to be lighter or softer to allow more time for the shaving lubricant to soften coarser sections of hair. Rinse your razor frequently, after every stroke or two. Avoid shaving the same section twice to reduce the likelihood of irritation. 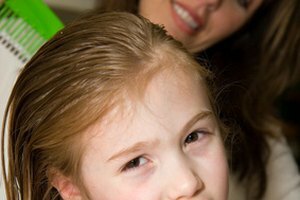 Rinse your scalp using warm water and a moisturizing shampoo. You want to remove any lubricant residue and hair as well as soften the scalp for moisturizer. Apply a rich moisturizer to your scalp after shaving. Products that contain aloe and vitamin E are good choices because of their healing properties. Avoid any aftershave products that contain alcohol. Applying lavender oil to the scalp after shaving can help prevent ingrown hairs. Use an exfoliating scrub on your scalp if you have a couple of days between Steps 2 and 3. A well-exfoliated scalp will be less prone to ingrown hairs and irritation.